A Continuing narrative which began in 1965 and can be viewed on this page following the photographs. Unfortunately the third Totem Pole at the WI Camp for the Blind, Rosholt, WI succumbed to interior rot. Under the leadership of Lion Bill Herschauer, the club decided to hire Pete Blazkowski, master carver and fellow Lion, to carve a fourth Totem Pole for the Camp. 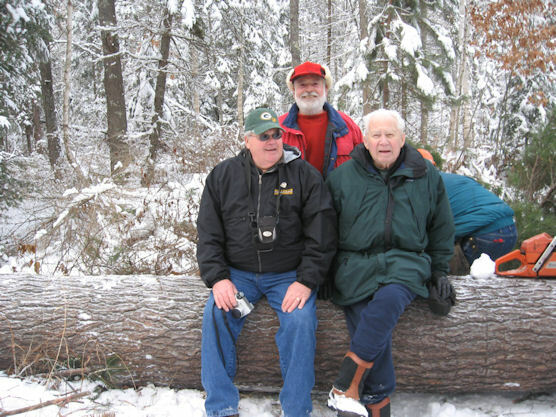 The Lac du Flambeau Band of the Ojibwe Nation donated a magnificent white pine and on Dec. 5, 2011, following a ceremony by Leon Valliere thanking the tree for giving its life, Lion Pete felled the majestic 94 foot tree. Circumference at the base of the tree was 111 inches and a rough count of growth rings indicated the tree to be 234 years old! The lower 43 feet was pulled from the forest by Jim and Judy Bowman, owners of Island City Drey who generously donated their time and wquiptment and transported it to Pete's home. 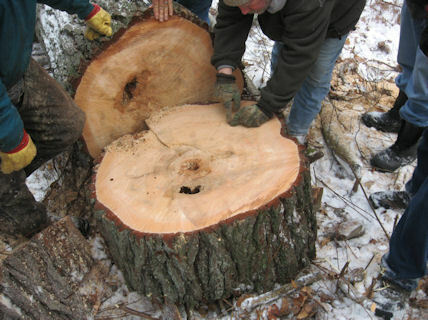 Some club members have offered to help Pete strip the bark off the tree and then the tree will be allowed to "cure" before the actual carving begins. 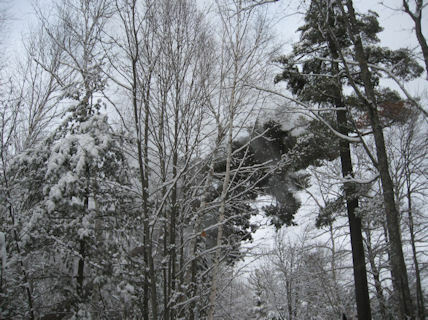 "It started because of a bolt of lightening that struck a large pine tree located on the shore of Lions Lake at (the WI) Lions Camp (for the Blind in Rosholt, WI) in 1965. The Totem Pole replaced the tree that marked the assembly place for the camp. "The first Totem Pole was carved from a 200 year old White Pine tree which was donated by the Lac du Flambeau Band (Chippewa Tribe). It was cut, trimmed and hauled out of the woods by club members and they spent a total of 800 to 1000 hours working on it. The top figure is an Eagle (or Thunderbird) representing the Clan of Carver, of religious significance. The second figure is Chief of the Eagle Clan. The third is the crane which denotes Wisdon, followed by the bear which denotes Courage, then the beaver indicating Ambition. The finished project stood 35 feet tall and was carved entirely by hand with small wood chisels and an occasional whack with an ax. It was designed by Bill Valliere. "This Totem Pole lasted about 15 years. Eventually, ants had invaded the base and the pole had to be taken down. The pole was cut in half and saved. It now stands on the sides of the fireplace in the dining building. The Lac du Flambeau club accepted the project of carving another Totem Pole in 1980. 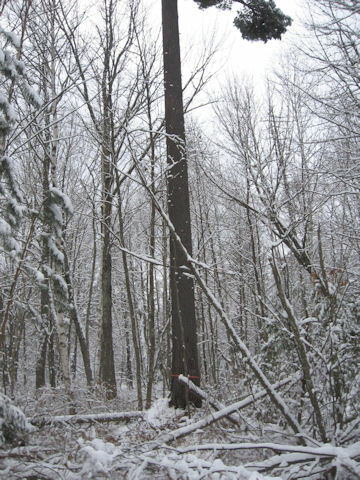 "This second pole really got started over 200 years ago, when a pine tree was born in a stand of virgin timber along the shore of the Trout River in the year 1776. 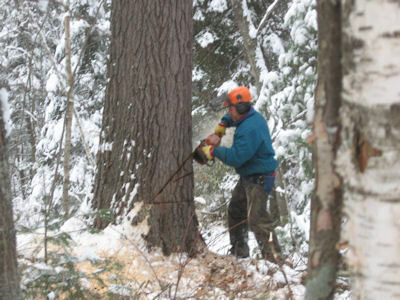 When this tree, a monarch White Pine (also donated by the Lac du Flambeau Band), was cut in 1981 it was one hundred twenty one feet nine inches tall. It measured 38" in diameter and was 10 feet in circumference. "The tree was then placed in a cocoon for over two years. Some people called it Jerry Meyer's basement! This is where the Lions began to work on it. It was only after many days of chipping, gouging and painting that the tree was converted and ready to emerge from the cocoon as a 38 foot Totem Pole. "Totem Poles are not native to Indians except for the northwestern Tribes of our continent. They were used primarily to tell the history of a family or clan. If there were still clans today, we are sure the Lions would be well represented in all of them. Although this Totem Pole, carved by the Lac du Flambeau Lions Club, is somewhat symbolic to Indian carvings, (it) was designed and created by the Lions Club. "The top figure selected was the Bald Eagle, which is called "mi-gi-zi-wag". The eagle was best known for his courage and bravery. It is not only our nations emblem, but it also reresents one of the most famous birds from WI, Old Abe, the mascot of the 8th regiment, Company C. In the Civil War he took part in 22 battles and 60 skirmishes. Old Abe came from the Lac du Flambeau Indian Reservation. "The second figure is the Beaver which is called "amik" known for his ambition as a hard worker, one who is always willing to work as part of a team to get the job done. It also represents the Lions Clubs who work together for the good of others. "The third firgure is the Raven which is called "gaa-goo-gishii". This raven is special because he has the eyes of the Owl, who sees in the dark. The raven is a very crafty bird, known to be mischievous, very loud and one who likes to attract attention. He is well represented by the Tail Twister in every Lions Club. This little Raven, whom by legend put the stars and moon in the sky, represents Lions world wide. "The next firgure is the Wolf which is called "ma-ling-an". One of the strongest of all the wild animals in North America and one of the fastest (he is) known to be an expert fisherman and family provider. He represents the Lions Clubs as the strongest service club in the world. "The last carving is the Lions emblem, representing the Lion which is called "mishibiz-hii". The Lions emblem is the low man on the Totem Pole, but it is also the most important, it is holding up all the rest. The Lions emblem represents the millions of Lions around the world supporting every project, every event, every program of service for their community." Eventually this Totem Pole also succumbed to ants. The Lac du Flambeau Club again took on the project for a third Totem Pole. This time we had it carved for us and steps were taken to keep ants from ever destroying the pole again. "To all the people who attend the Lions camp, we, the Lac du Flambeau Lions Club dedicate this Totem Pole to you. We call it "na-wak-wa", which means a meeting place for friends. We hope that this place will always be a nawakwa (and may everyone) find it a place of friendship."